I agree because Friendship is many things , is not one thing. It had many definitions. The quote means to me that friendship is important and that it has alot of good things that makes good memories and that it is meanful in our life. it means "that friendship is not just a simple thing it means more being friends with someone that doesn't ask you to change but respect who you are "
The message is trying to explain that friendship is simple but hard to understand because a real friend is someone whos with you in hard moments. I agree with this quote because friendship is simple but hard to understand. Friendship is one of the best things in life. A friend its like a brother friendship is a lot of little things because there are a lot of little details in a friendship. Friendship is one of the most beautiful things in life and we have to take advantage of it because friendship is part of our life. I agree because a friend is not a big thing it is a million of things because a friend is a person that give a lot of things no a big thing in all live.Josué Viteri 7mo "Air 1"
It´s trying to say that friendship is important as million of little things because friendship is a thing that every person in the world need . Frienship is very important because if you need someone or something a friend will be there for you and help you. I agree because for my that is true because friends are people that will be with you even when you are fight and they will help you when you need them. I agree because a bestfriend is not only one thing is a million of things because she is with you all the time caring and helping you in good times or in bad times. It tries to show us that we can be happy with many friends and not only with only one. The purpose of this quote is to show the truth side of a real friendship. That quote of frienship means to me that frienship is not a big thing, it is a million of little things. That quote tries to teach us that frindship is a valuable thing and we have to take care of it. And I agree with it because that quote tells the thrues about frienship. Friendship comes from little details to a big expression of caring. A friend is a brother, although you do not share the same blood. Someone you can trust and that you know will be there in the difficult situations in life. There a few REAL FRIENDS so we have to take advantage of them because the mayority of people will criticize you but a REAL FRIEND respects and likes you for the way you are without any interest. The quote means for me that friends but real friends cant be separated because it would be like a planet crashing with other. Friendship means to be always in the bad things and in the good moments because that is when we know when it is a real friend or only a parner. I really agree with this quote because it has a big message. 1.that you have to know how are your friends to be your best friends. 2.that you have to treat your friends good . 3.yes, because you have to know more your friends to they be your best friends. that you have many friend but only one is your real friend. yes, because it is real that frienship is not a big . without our friends we will get alone.I interpret the quote in good form and i agree with it. For me friendship means to have a friend that help you in the good and in the bad moments,friendship are good moments with your friends,to be happy. 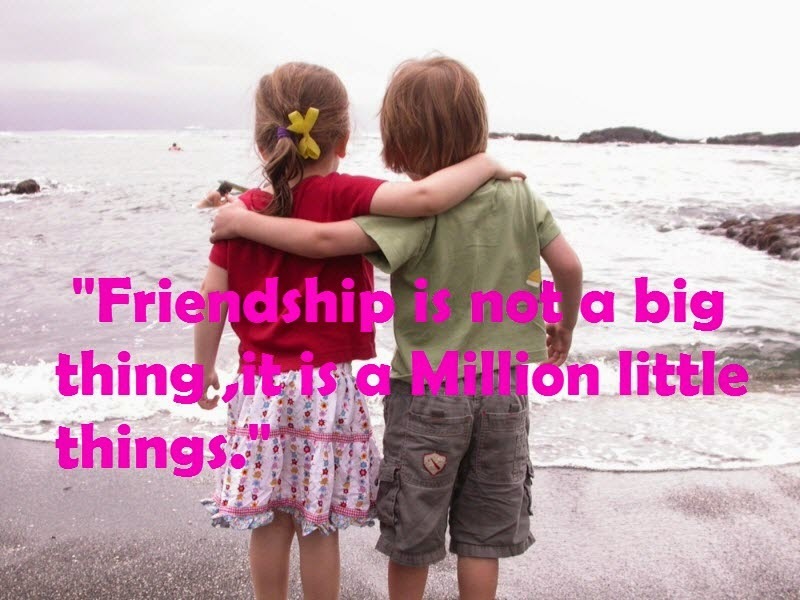 I Think The Quote Its Right Because Friendship Is The Best Thing In The World It Doesn t Madder It Its Boy Or Girl. That friendship is not too much to see, but is too much to feel.Yes i agree . This quote means that frienship is an important value for people and we have learn values because we are going to be good persons and do a lot of friends. I think what its trying to say is that friendship isn´t just oh im his friend and nothing more it means that friendship is important and you also have to always be there for your friend never just say your his friend and never be with him or play with him that is what the quote means.I also agree with the quote. Yes I agree because a best friend is a person that always share with you at the bad times and in the good ones. I interpret that the friends no are the best in your life because some of them love you when you have all, but when you don't have nothing, they tray you and give you the back. I agree, because things like the family are more important in your life. That the friends are the best things in the world. I have many friends,my brother is a little crazy but my best friends and I past the limit of that,you have to always believe in your friends but in your REAL FRIENDS. I agree with it.